Till now two case series had described the deposition of microfibrils in the interstitium of heart. One series showed deposition of microfibrils in cyclosporin-treated cardiac transplants. The other series of four cases were idiopathic in nature. 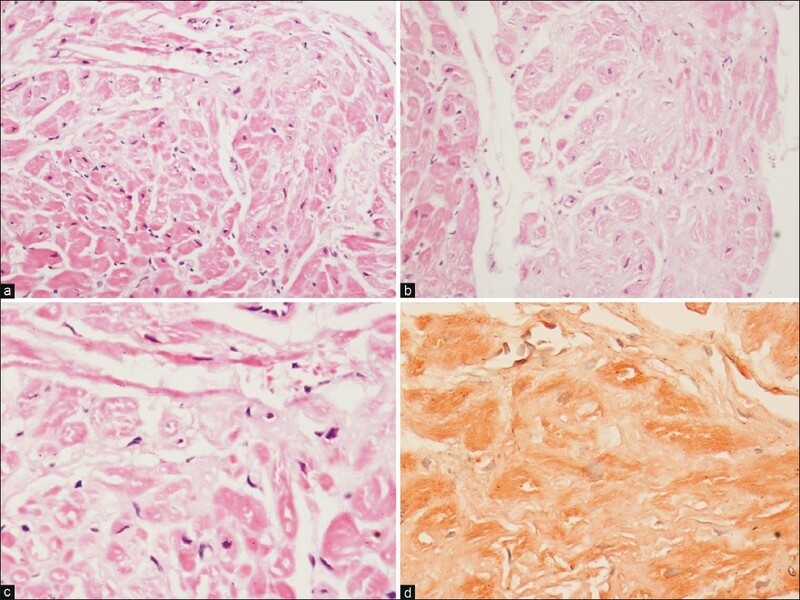 We had seen a case of microfibrillar cardiomyopathy on endomyocardial biopsy. The case is being reported for its rarity. The index case was 44-year-old male who was admitted in a private hospital with a history of shortness of breath (NYHA class IV) for the last 4-5 years. He later developed pedal edema. Subsequent investigations (echocardiography and Doppler imaging) revealed features of RCM. Both the atria were dilated. Both the ventricles had normal systolic function along with moderate mitral and tricuspid regurgitation. His coronary angiogram was normal. The diagnostic specimen was an endomyocardial biopsy that was sent to our pathology department. The endomyocardial biopsy comprised of three fragments. The endocardium was unremarkable. The subendocardium and interstitium showed deposition of extracellular eosinophillic amorphous hyaline material. Some of the cardiomyocytes were atrophied. The blood vessels were unremarkable. The material resembled amyloid on hematoxylin and eosin stain. However, special stains for amyloid like Congo red stain, crystal violet and thioflavin-T were all negative [Figure 1]. The tissue was then retrieved from the paraffin block and processed for an electron microscopic (E/M) examination. Under normal circumstances, the interstitial connective tissue matrix of the heart is composed of collagens (primarily types I, III, and IV), laminin, fibronectin, proteoglycans, elastin, and microfibrils. Microfibrils are small (range, 4-25 nm length and mean, 8-12 nm diameter) and are often found in association with elastic fibers. , The microfibrils display a "beads on a string" structure. The average periodicity of these beaded microfibrils when isolated and in the untensioned state is 56 nm (range, 33-165 nm). Electron microscopy of the present case showed bundles and tangled masses of microfibrils that were lying loose in the interstitial space. These microfibrillar masses did not form parallel arrays and were away from cardiomyocytes, sarcolemma, or basal lamina. This is unlike amyloidosis where the deposition is around the cardiomyocytes. At higher magnification, twisting of individual fibrils was noted [Figure 2]. The clinical details, histopathological findings, and an EM picture of the index case would best fit with the diagnosis of microfibrillar cardiomyopathy. The patient was lost to follow up and hence further clinical course could not be assessed. Microfibrillar cardiomyopathy is a rare form of infiltrative heart disease leading to RCM. , Till date, only two case series regarding microfibrillar-related cardiomyopathy are available. Myles et al. had described a series of cyclosporin-treated cardiac transplant patients. In this study, eight cases had interstitial microfibril accumulation as seen on electron microscopy. The fibrils were hollow, beaded and they measured 8-10 nm in diameter. The authors suggested that these microfibrils may be related to cyclosporin-induced fine interstitial fibrosis that can reverse following withdrawal of cyclosporin. Factor et al. had first time described idiopathic microfibrillar cardiomyopathy in four patients. The endomyocardial biopsy of these patients showed a similar type of deposition in the subendocardial region and in interstitium. Electron microscopy had proven the presence of microfibrils. The histopathological examination of present case also revealed interstitial accumulation of hyaline eosinophillic material similar to amyloid. This material did not stain with Congo red, crystal violet, and thioflavin-T. Electron microscopy confirmed the presence of microfibrils. Prognosis of microfibrillar cardiomyopathy is difficult to determine since only a few cases have been described in the literature. Factor et al. had documented four cases, all of whom had a short follow-up. In their study, only one case had a follow-up for 2 years and was doing well. No comment regarding the clinical course of the present case is possible as the patient lost to follow up. Because of scarcity of the available literature it is difficult to provide the precise management protocol of microfibrillar cardiomyopathy. However, hypothetically such a case will probably be an ideal candidate for heart transplantation. In summary, we have identified a case with features of RCM that had an amyloid-like material deposition in the interstitium. The electron microscopy showed accumulation of microfibrils. The exact etiology of the microfibrillar deposition is unknown. The pathologists should be aware of this entity. All cases with Congo red negative amyloid like deposition should be subjected to electron microscopic examination to rule out the possibility of microfibrillar cardiomyopathy. We are grateful to the Department of Pathology, AIIMS, for providing the facilities and resources. 1. Maron BJ, Towbin JA, Thiene G, Antzelevitch C, Corrado D, Arnett D, et al. Contemporary definitions and classification of the cardiomyopathies: An American Heart Association Scientific Statement from the Council on Clinical Cardiology, Heart Failure and Transplantation Committee; Quality of Care and Outcomes Research and Functional Genomics and Translational Biology Interdisciplinary Working Groups; and Council on Epidemiology and Prevention. Circulation 2006;113:1807-16. 2. Nihoyannopoulos P, Dawson D. Restrictive cardiomyopathies. Eur J Echocardiogr 2009;10:23-33. 3. Eshaghian S, Kaul S, Shah PK. Cardiac amyloidosis: New insights into diagnosis and management. Rev Cardiovasc Med 2007;8:189-99. 4. Hager S, Mahrholdt H, Goldfarb LG, Goebel HH, Sechtem U. Images in cardiovascular medicine. Giant right atrium in the setting of desmin related restrictive cardiomyopathy. Circulation 2006;113:53-5. 5. Myles JL, Ratliff NB, McMahon JT, Tubbs RR, Golding LR, Hobbs RE, et al. Cyclosporin-associated microfibrils in cardiac transplant patients. Am J Cardiovasc Pathol 1988;2:127-32. 6. Factor SM, Menegus MA, Kress Y, Cho S, Fisher JD, Sakai LY, et al. Microfibrillar cardiomyopathy: An infiltrative heart disease resembling but distinct from cardiac amyloidosis. Cardiovasc Pathol 1992;1:307-16. 7. Robinson TF, Cohen-Gould L, Factor SM. Skeletal framework of mammalian heart muscle: Arrangement of inter and pericellular connective tissue structures. Lab Invest 1983;49:482-98. 8. Haust MD. Fine fibrils of extracellular space (microfibrils): Their structure and role in connective tissue organization. Am J Pathol 1965;47:1113-37. 9. Inoue S, Leblond CP. The microfibrils of connective tissue: I. Ultrastructure. Am J Anat 1986;176:121-38. 10. Sakai LY, Keene DR, Engvall E. Fibrillin, a new 3% kD glycoprotein, is a component of extracellular microfibrils. J Cell Biol 1986;103:2499-509.